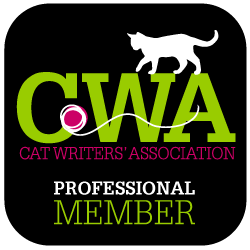 I consider Deborah Barnes a good friend in the cat blogging world -- heck, she's just a good friend! She has a gift for heartfelt storytelling. This is something that doesn't come especially naturally to me, so I respect her gifts in a big way. You may remember her first book, The Chronicles of Zee and Zoey, an inspirational tale that's written from Deborah's point of view. She made me cry. OK, it's not that hard to do -- I'm a sucker for those coffee commercials where the soldier comes back and surprises his family. Oh, and anything animal-related ... obviously. 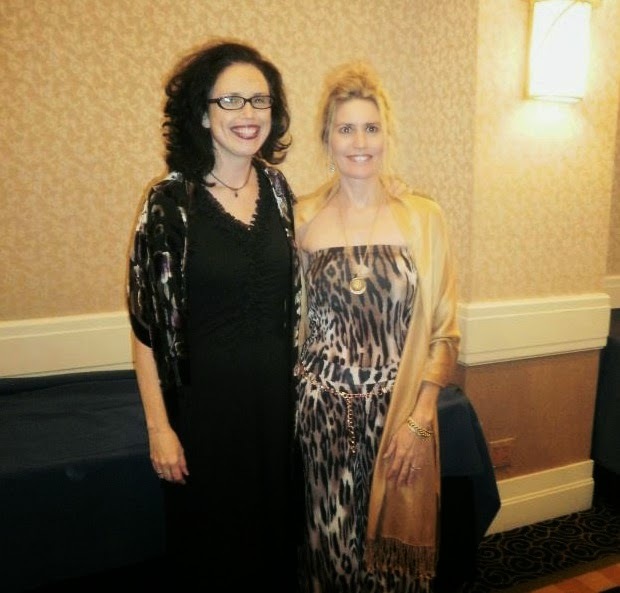 Deb and I at the 2011 Cat Writers' Association conference. Yes, she's always in spots! I was excited and grabbed an extra box of tissues when she sent me a copy of her newest book, Purr Prints of the Heart: A Cat's Tale of Life, Death, and Beyond. Seriously -- even the title makes me tear up a little. Thanks, Deb! 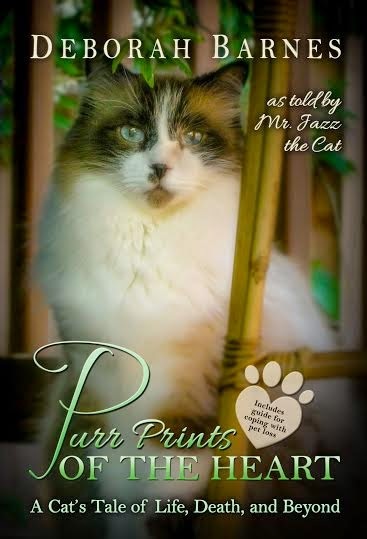 This book is another sweet story, but this time told in the voice of Mr. Jazz, Deb's beloved ragdoll cat who came to her as a sick little kitten. Throughout the chapters, Mr. Jazz shares the day-to-day ups and downs of his life in Deborah's home. I loved reading about his relationships with the other animals in the household. In my mind, I saw everything play out like a Disney movie, but without the Lady and the Tramp-style spaghetti kisses. More gorgeous cover art from Deb. 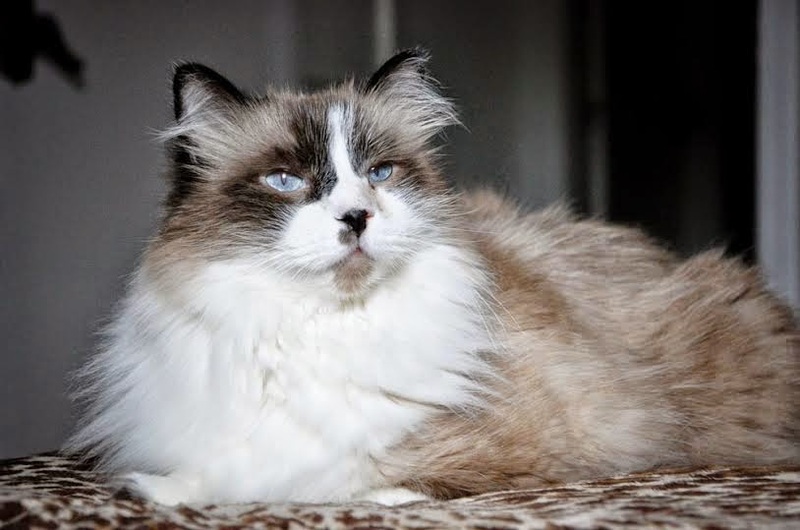 Mr. Jazz relates his story from the time he joins the family until the day he passes over the Rainbow Bridge at age 15. What's unique about this book is the look at illness and death from a cat's point of view. We see it as his beloved animal friends pass, and as he moves through sickness into his final days of life. It's beautiful, and will certainly strike a chord for anyone who's lost a much-loved pet. Purr Prints made me smile just as much as it sent me to tears. It perfectly captures the wide range of beautiful emotions we all feel during a lifetime. And the grief guide in the back of the book is a solid way to end the story. Again, carefully and thoughtfully written. Mr. Jazz at his tip-top! This book is a wonderful gift for any cat lover, but especially one who's recently lost a pet. My cats are ages 10, 12 and 13. They're older than any cat with which I've shared my life. I can't imagine the pain and grief I'll feel when they pass, but I'm grateful to have this book close at hand. I know it will help guide me through the healing process. And make my cry again. Give your kitties an extra hug today. You can buy Purr Prints of the Heart on Amazon by clicking here.